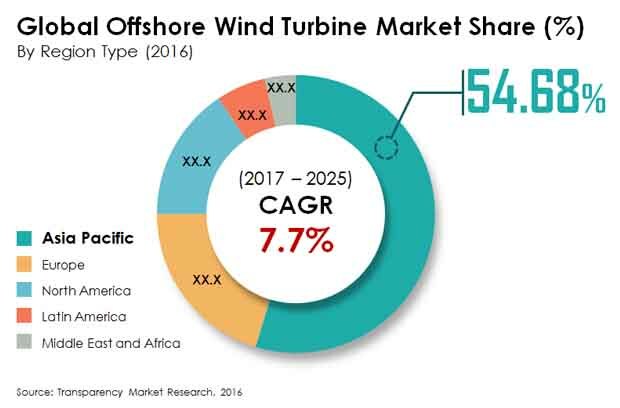 The global offshore wind turbines market is dominated by companies such as Siemens Wind Power, Enercon GmbH, Vestas Wind Systems A/S, Gamesa Corporacion Technologica SA, Xinjiang Goldwind Science & Technology Co. Ltd., Guodian United Power Technology Company Ltd., Suzlon Group, GE Wind Energy, and Upwind Solutions Inc. The global offshore wind turbines market is likely to expand smoothly in the coming years, due in part to the steady government support being provided to the market in several regions. This has also made entry of new players likely in the global offshore wind turbines market. According to Transparency Market Research (TMR), the global offshore wind turbines market is expected to almost double in valuation over the 2017-2025 forecast period. The offshore wind turbines market’s valuation is expected to rise from US$29.4 bn in 2016 to US$58.6 bn by 2025, at a solid CAGR of 7.7%. Regionally, emerging economies in Southeast Asia are likely to be the leading contributors to the global offshore wind turbines market over the forecast period. Several economies in this region, including dynamic rising economic powers such as China and India, have set definite targets for wind power generation, among the rising support being provided to a number of alternative power sources. This is the major driver for the Asia Pacific offshore wind turbines market. The increasing wind energy operations in the Pacific Islands and Japan are also crucial for the global offshore wind turbines market and are likely to constitute a key part of the offshore wind turbines market in Asia Pacific. The scientifically oriented developed economies in Western Europe are also expected to be major consumers in the global offshore wind turbines market. Leading countries in the region, such as Germany, France, Belgium, and the U.K. have paid great emphasis on development of the wind energy sector in recent years, which has led to steady demand from the offshore wind turbines market in Europe. Continued development of the Europe offshore wind turbines market is also dependent on a large extent to the steady progress of the wind energy sector in Scandinavian countries. The availability of easily accessible and controllable water bodies in abundance has driven the offshore wind turbines market in Northern and Western Europe. The key factor propelling the global offshore wind turbines market is the significant cost advantages they present over conventional wind turbines. This is also illustrated within the hierarchy of the global offshore wind turbines market, which is led by the floating turbines segment in terms of foundation. The high expenses of constructing a solid foundation have made floating offshore wind turbines more feasible. They are likely to remain the leading contributor to the global offshore wind turbines market in the coming years due to the growing ease of installing floating offshore wind turbines even in developing regions. The steady government support in Europe, particularly around the North Sea, and Asia Pacific is the prime driver for the global offshore wind turbines market in the coming years. Moreover, in many developing countries, private investment in the wind energy sector has also been forthcoming, which has led to strong growth of the offshore wind turbines market.